New Orleans knows how to throw a good party, so it makes sense there are plenty of places to choose from when looking for the perfect place for your wedding reception. Here are 10 places that will help you have a great time. When it comes to food at Broussard’s, the restaurant offers banquet menus, but a bride and groom can also add items to the menu if they prefer. 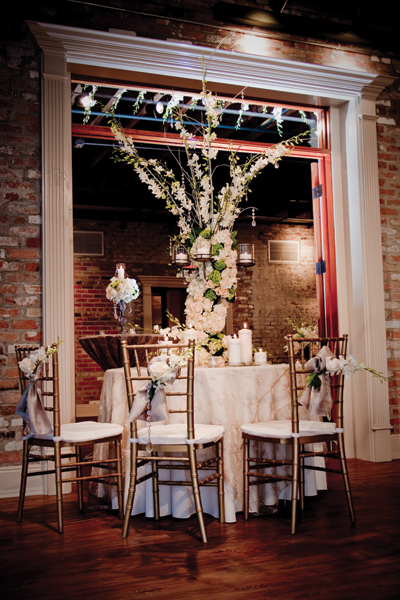 With its brand new building, The Chicory has become one of the largest wedding venues in New Orleans. Centrally located in the historic Warehouse District, the building was once a coffee warehouse and has since been transformed into an elegant event space. “It gives that rustic New Orleans feel, with exposed beams, exposed brick walls and brass gas lanterns still intact,” says Brent Bogan, the wedding sales manager at The Chicory. There are currently three rooms and a bridal suite in the original Chicory building, but the new building right next door, which will be called The Gallery at the Chicory, will feature three floors, one being a 5,000 square foot rooftop deck. Bogan says it will be perfect for cocktail hours and ceremonies. Since acquiring the new building, The Chicory owns the whole block, which is a plus in the New Orleans nightlife scene. “We don’t have restrictions on noise or hours anymore, because we own the whole block, so we will be able to accommodate the after parties,” Bogan says. The most important thing for any wedding, though, is the atmosphere, and Bogan says The Chicory prides itself on running on “a completely different model than most other wedding venues.” “From the food, the uniqueness of the venue and the service of our staff, we are different than anything else in the city,” Bogan says. Located in a quiet area right on the Mississippi River about 20 minutes from downtown New Orleans, this scenic location is perfect for couples looking for a New Orleans wedding without the hassle of being in business of the city. The big draw to Courtyard on the Ridge is that it is family oriented, and all the food is made on site by Laderer. “There is enough room for a large dance floor that everyone can get out on all at once, and the tables are big enough for a whole family to sit at, and still put food on the table, too,” Laderer says. One of the best-kept secrets in options for New Orleans wedding receptions is the Hampton Inn and Suites New Orleans Convention Center. Located in the Warehouse District and exuding that old New Orleans feel, Hampton Inn and Suites New Orleans Convention Center is not your typical Hampton Inn, says Amanda Baker, the location’s conference services manager. All the weddings are held in the 5,400 square-foot ballroom, which attaches to an outdoor courtyard and pre-function area. The main ballroom has high ceilings and crystal chandeliers, as well as traditional wood flooring and exposed brick to give it the vintage feeling. The wedding packages are also all-inclusive, which makes it easy for brides since it is an all-in-one venue. Wedding guests can stay in any of the 300 rooms that the location offers, which is nice because it is centrally located for out-of-towners. “If guests want to go out after, it’s only a 15-minute walk to the French Quarter, and there are plenty of local bars, shops and restaurants along the walk,” Baker says. Part of what makes the House of Blues unique is it’s made up of a variety of spaces. The Parish Room, which holds 100-150 people, is “probably our most popular wedding venue at this time,” Tassin says. The second most popular is the main hall, House of Blues’ music hall, which holds 200-500 people. Another aspect that makes House of Blues a “one-stop-shop” is how the staff can help brides find wedding entertainment. Since House of Blues is mainly an entertainment location, the staff has great relationships with many local and national acts. If you are looking for a beautiful and historic rustic New Orleans space, Latrobe’s on Royal is the perfect spot. Located in the heart of the French Quarter, Latrobe’s is in one of New Orleans’ many architecturally significant buildings. Originally used as a bank in the 1800s, Latrobe’s features original stonework, a whisper dome, bank vault room and courtyard. “We don’t rent the space room by room, because each room flows into each other, even though the two main areas have two different vibes,” Adler says. The “vault bar,” an area that was once the safe where the money was kept, is a popular room as well as the “outdoor courtyard area” which was actually enclosed in the early 1900s, Adler says. “It was originally an open air courtyard, but even today, a lot of people think they are outside because it feels like you are outside, but its protected from rain and humidity,” Adler says. Another bonus is that Latrobe’s works exclusively with John Besh Catering Services. “We have an emphasis on amazing food and service,” Adler says. And you can’t forget the location, as it’s only blocks away from the center of the city. “It’s a great location, especially because it gives guests a fun place to go out immediately afterwards,” Adler says. The Marigny Opera House sets itself apart from reception locations mainly because it’s not technically a reception location. “The mission of the Marigny Opera House is to support local performance artists,” says Brandon Sanford, the location’s wedding and event coordinator. Weddings help fund those local performances, so the location allows one to two weddings a month. So in addition to having a wedding, brides at the Marigny Opera House are also helping the New Orleans arts community. What brides pay for the location is tax deductible, since it is a donation to the Opera House. As soon as you walk on the grounds of Race and Religious, it’s easy to understand why the location is a popular spot for both local and out-of-town couples. Even the smallest wedding package includes access to the location’s three spaces, a security guard and furniture, such as tables and chairs. Some brides will rent the grounds for a whole weekend and hold their rehearsal dinner, ceremony, reception and post-wedding brunch all at the same place. The staff at Race and Religious is flexible regarding how long couples can reserve the space. The flexibility of the locations also allows you to bring in your own caterer and your own alcohol, plus your own decorations if you want to personalize the space. Redemption puts a whole new spin on the traditional wedding reception. True to its name, the restaurant and event space is in a reclaimed and newly renovated 100-year-old church in the heart of Mid-City. The space features a large dining room, which is in the main part of the old church with high ceilings, wooden floors and stained glass windows. Unlike other properties, when you have your reception at Redemption, you are booking the entire property, which gives each couple a specialized experience. “We like to think of ourselves as a premier party space with an amazing restaurant added on,” Picolo adds. When you’re ready to choose your menu at Redemption, the staff works with customers to make sure you get exactly what you are looking for. As a vibrant music venue and nightclub in a 160-year-old building, Republic New Orleans mixes the old with the new, creating a very fun but beautiful reception space for New Orleans brides. “Republic exudes vintage New Orleans charm with hand-painted murals, exposed wooden beams, and stunning crystal chandeliers while also utilizing modern luxuries like state-of-the-art sound and lighting systems,” says Jessica Talazac, the director of special events at Republic New Orleans. The rustic feel of the space paired with the nightclub experience and young staff makes it a special spot. “We embrace the fact that we are a non-traditional venue that strays from the cookie-cutter ballroom setting and allows you to customize the space so that your wedding is one-of-a-kind,” Talazac says. What attracts young brides is that Republic New Orleans’ major function is to be a nightclub and music venue so it allows for a fun environment for wedding guests. “Our experience as a nightclub ensures that we know how to throw an amazing party,” Talazac says.